Today their debut studio album Bones of What You Believe is released in the States. The group is electropop, but if you like Arcade Fire or Bastille or Depeche Mode, you’ll probably like CHVRCHES. As an author, I’m always on the lookout for new music to listen to while I run through a scene, write or just to get me in a certain mood. Although I haven’t heard every single song on this album, I have no doubt that Tether will be a theme song for a character in one of my young adult novels. The Mother We Share is another good one to get me in a happy, upbeat mood and I’m visualizing a scene with two best friends hanging out, listening to music, trying on clothes, talking boys and just being teenage girls. Check out the CHVRCHES BBC session video of The Mother We Share:. Do you like? 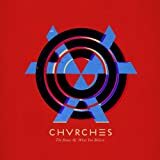 Listen to CHVRCHES on SoundCloud.